The art of piercing has been around forever and fortunately the technology has changed because I can't imagine a sabertooth through the ear would be less than torture. You might remember the Parent Trap movie featuring Lindsay Lohan back in her prime? In that story, the twins needed to pierce one of the twins ears so that when they swapped, their parents' wouldn't suspect anything. This was done using ice and a needle. Do not try that at home. People actually get pierced for many different reasons, from religion to rebellion. Others simply want to express themselves or must get pierced according to their culture. You may have seen punks with safety pins through their lips or ears. This is not an appropriate piercing instrument. When it's your body you're playing with you need to trust your piercer and the instruments that they are using. Polymorph at Newtown prides themselves on never using guns and only using the highest grade of metal in their jewellery. Sticking with the Newtown theme, Industrial Strength Australia are also piercers you can trust. A little history lesson for you - earrings are mentioned in the Genesis section of the Bible so even Jesus approves. Try using that one against your parents. Also, Shakespeare, one of the greatest writers of all time, rocked a single earring. 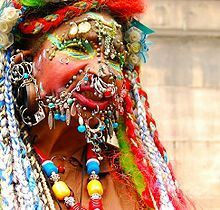 Remind the sceptics of that fact next time they tell you piercings are for the trashy. There are so many different kinds of piercings out there, whatever will you choose? Piercings range from nose to neck to down below. There really is something for everyone. As you know, there are stereotypes with certain piercings but they are usually held by those who have their head stuck in the sand. Like anything, the small majority can give something a bad name. Whether it's New Years, you're in Berlin and it seems like the best idea to pierce your man bits or you're bonding with your cousin over belly and tongue rings, piercings can instantly change not only your physical experience but your attitude. It's a case of short term pain for long term gain. The adrenalin of getting a piercing is amazing; the feeling of being pierced, not so much. Each body part and person has a different pain tolerance. Getting your ears pierced traditionally on the lobe, is only a short pinching feeling whereas a tongue piercing doesn't hurt and actually feels like a hot knife through butter. Inner ear piercings are more delicate and painful because cartilage is involved. Of course there are risks concerned with piercings. Everyone has heard the myth that there is a chance that an eyebrow piercing may leave your face half paralysed but if you are going to a reputable piercer, chances are everything will be fine. 1. Can I wear them at work? 2. Can I deal with a scar from this if I take it out? 3. Will your parents/other half/ co-workers approve or look at you differently and do you care? You can find Polymorph here. and Industrial Strength Australia here. Remember, you can always take piercings out – nothing is permanent so chop and change to your hearts' content. Live life! Why? It's time to cave into the crave for change. When: When you summon the guts.